The maples have long been used as Tonewoods. 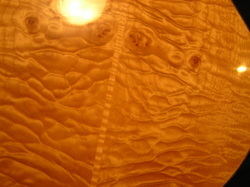 Quilted maple has a deep three dimensional look. Prized for its beauty it is frequently used for musical instruments especially guitars.